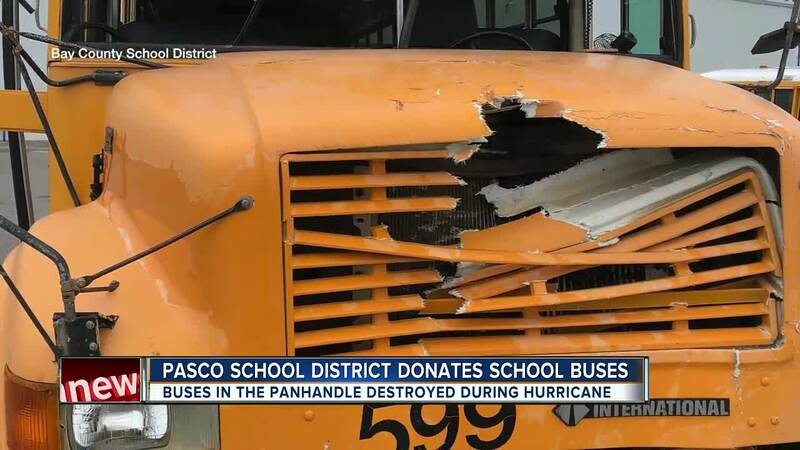 PASCO COUNTY, Fla. — A Bay Area school district is stepping up to help a Panhandle school recover from Hurricane Michael in a very generous way, by giving them 20 school buses. "My bus, the windshield was blown out of it, folded up, and down in the wheel well. Another bus had a trailer on top of it," said Jeff Oleck, a bus driver for Bay County Schools. Many school buses in Bay County had damage from Hurricane Michael. "It's your livelihood. It’s your community. It's transportation for the children that have no other way to get to school," said Oleck. When Pasco County School District heard about the need for buses in Bay County they knew exactly what to do. On Thursday they gave them 20 buses they had already planned to sell. "Heaven forbid, if something were ever to happen to Pasco like a storm coming through the Tampa Bay area and us needing help, I would hope that other school districts would be there to help up get back on our feet too," said Kurt Browning, Pasco County Superintendent. Bay County bus drivers showed up in Pasco County on Thursday to drive the 20 buses home. "It's quite a gift, quite a blessing, and you guys don't know how many lives you’ll effect," said Oleck. Pasco County Schools are also sending 20 maintenance workers up to Bay County this weekend to help them prepare for the schools to reopen.